The debate whether African art belongs in Global Exhibitions is one that dominates many art forums across the continent and beyond today. Artists, in a bid to assert their position in this era of globalization and emerge as international citizens, have continuously produced artworks that tackle global themes like Environmental conservation, Recycling, Consumption, Material culture, Corruption, Gender & Sexuality and Feminism. Ghanaian sculptor artist, El Anatsui is often identified as one of the Contemporary African artists whose artwork penetrates the International podium of Contemporary Visual arts using the theme of recycling. The artist working with found objects like aluminum, copper- wires and discarded liquor bottles turns this waste material into dramatic and complex sculptures that imbue distinctive visual impact. The sculptures often in large scale size composed of thousands of crumpled bottles stitched together with copper wire form a luminous and weighty object that easily captures the attention of the viewer. Gravity and Grace, the name of his solo exhibition at the New York Museum in 2013, showcased sculptures crafted from wood and metal that transformed appropriated objects into site-specific sculptures. The displayed pieces were characteristic of monumental wall and floor sculptures that breathed energy into the space they occupied. Based on such story and presentation, his work challenges the traditional perception on sculptures as stationery objects made of hardwood and not synthetic material. 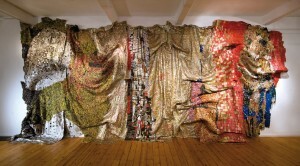 Anatsui’s artwork has the ability to effortlessly find itself in contemporary art spaces in Europe and Americas because it not only addresses the popular subject of recycling that is embraced in many Western capitals, but brings to the fore the concept of cross-cultural exchange between Africa, Europe and Americas using African medium. 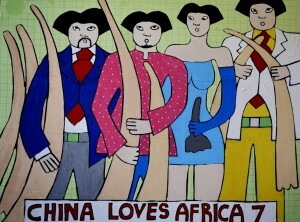 The artist Michael Soi is one of the most sought after artists on the continent today by many African art collectors. Soi, working in caricature style confronts social issues like corruption, consumption and material culture using wit and satire. Though his work is primarily interpreted as fodder for the affluent Kenyan middle class who have the money to buy it- his diptych painting, Monday Morning, sold for over KSH200,000 at the East African art Auction, in Nairobi 2014- it is palatable to audiences beyond Kenya because it questions the motive under which the West provides Aid to the continent – an interpretation of neo-colonialism ; it satirizes the hobby of male prostitution: young Kenyan men selling their well-toned bodies to elderly pensioner white women. This ominous act of modern day slavery is rampant on Kenya’s coastal beaches. The art also decries the vice of consumption that is evident in many bars and Night Clubs in Kenya’s capital, Nairobi. 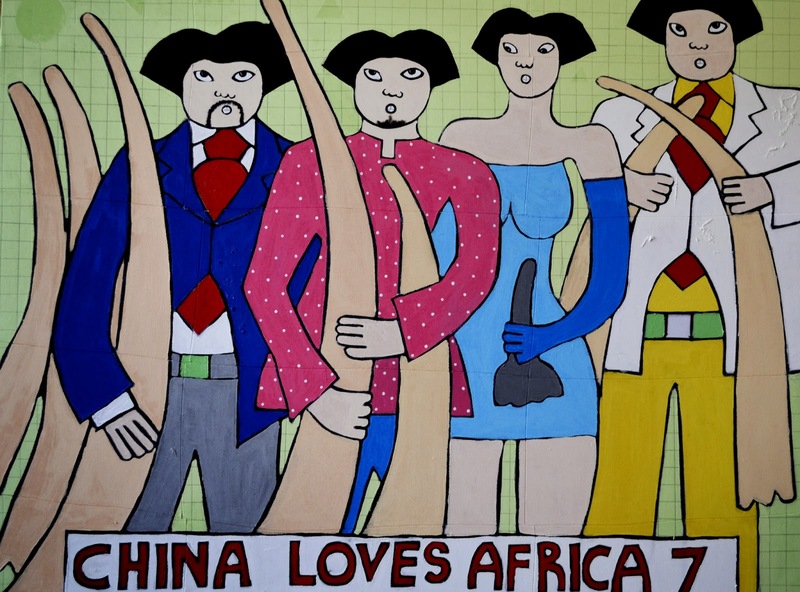 Soi’s series of paintings, China loves Africa -2013, The General Election and Nairobi Night Life effectively explores and discusses the above mentioned themes. In her solo exhibit ion in 2014 at Makerere Art Gallery, Dr. Rose Kirumira, Senior Lecturer at the College of Engineering, Design, Art and Technology ( CEDAT) formerly MTSIFA, showcased sculptures under the theme, Archives-Tradition and Artistic Inspiration. The artwork in form of a variety of domestic objects, aimed at creating awareness about Uganda’s material culture (and also preserving it) and invoking the debate of collective nationalism and its importance. The household articles like Nsubi, Mweso evoked the traditional artistic quality of African traditional society- the Mweso (Mancala game), was a popular in- door game at the court of the Kabaka in central Uganda. These featured artworks were fused into contemporary art using aluminum plates, copper wires that embellished the hardwood. Using found objects in this exhibition, served two purposes: Firstly, created an interesting visual narrative between artist, artwork and audience; secondly, fostered the aspect of recycling that leads to environmental conservation. Like cited before in the work of Anatsui, the former two qualities are important in global exhibitions because they elicit debate from the audience; a crucial form of endorsement in contemporary arts. Working on the concept of archives, Kirumira’s work promoted the aspect of research in the contemporary arts. While the archive served the purpose of reliving old household materials like the Ntamu and Nsubi, it also legalized her exhibit as an academic material to be used by students at the institution. The artworks of these artists and many others not mentioned in this article validate African art in global exhibitions because of subject matter, theme and technique used. Their intellectual output demystifies African art as primitive and not worthy of international audiences. 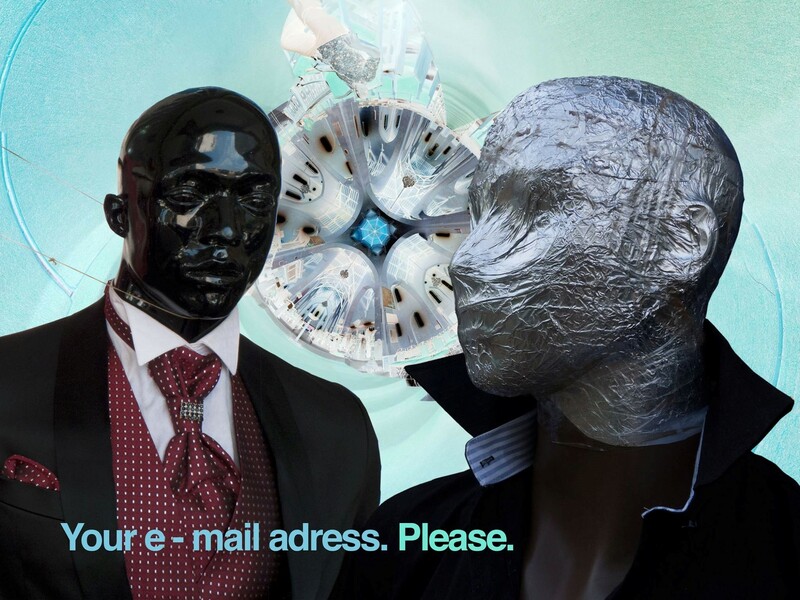 Upon such background, artists working on the continent are equipped with a legitimacy as well as confidence to create for a wider audience beyond the locale they live in.